It must have been over two years ago when I first bookmarked this recipe. 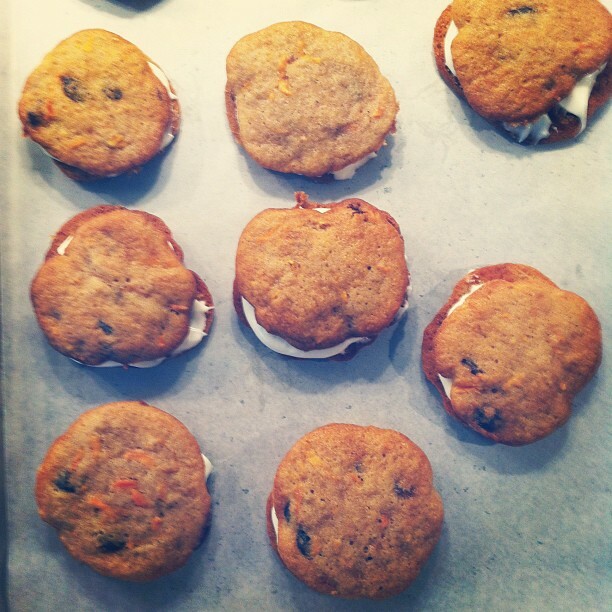 A mix-up of the classic carrot cake and cream cheese frosting, two cookies with the sweetest center. How can you turn that down? I finally found reasons to justify making them- our upcoming 4th of july party AND fresh carrots in the garden. We ate these after a great meal at Lee's, transporting them on the golf cart along with salad from the garden (summertime lettuce, what! ), black rice, and two cowboys. 1. Put oven racks in upper and lower thirds of over and preheat oven to 375. 2. Whisk together flour, cinnamon, baking soda and salt in a bowl. 3. Beat together butter, brown and granulated sugars, egg and vanilla in a bowl with an electric mixer at medium speed until pale and fluffy, about 2 minutes. Mix in carrots and raisins at low speed, then add flour mixture and beat until just combined. 4. Chill dough in freezer for 15 minutes. 5. Drop 1 tbsp batter per cookie 2 in. apart on wax paper and bake, switching position of sheets halfway through baking, until cookies are lightly browned and springy to the touch, 12-16 min. total. Cool cookies on sheets on racks 1 minutes, then transfer cookies to racks to cool completely. 6. While cookies are baking, blend cream cheese, powdered sugar and honey in a food processor until smooth. 7. Sandwich flat sides of cookies together with a generous tablespoon of cream cheese filling in between.